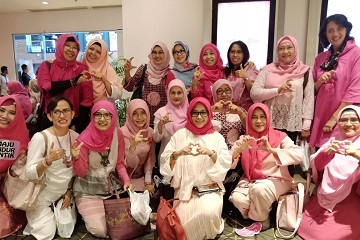 Agrianita of Bogor Agricultural University (IPB) in collaboration with the Love Pink Indonesia held a watching activity on a movie titled Pinky Promise together in Cinema XXI of Botani Square Bogor (10/4). A total of 134 participants attended came from various groups ranging from female lecturers, wives of lecturers, female educational staff and female students of IPB. Even the Rector and Dean also joined the activity. Retna Widayawati who is familiarly called Neno, wife of IPB Rector and the Chairman of Agrianita, said that this activity was an effort to educate health to all IPB family. "Agrianita conducts medical check-up every year in IPB, which is usually done in conventional ways such counselling which is only about 20% of the knowledge that participants can absorb. This year, I invited the Love Pink Foundation to conduct health education in a fun way. "Ladies became more enthusiastic and can socialize with other participants," said Neno Arif Satria. Pinky Promise is a movie inspired by the Love Pink Foundation that focuses on health issues in breast cancer. Love Pink Foundation itself is a forum for breast cancer fighters, ranging from meditation, support and other positive activities. This movie was aired in 2016, then used as educational material by the Love Pink Foundation to emphasize breast cancer issues in Indonesia. The movie shows the struggle of breast cancer patients in fighting the disease. The real action to prevent and cope with breast cancer in the neighbourhood is also performed. Neno told that the movie is full of meanings, including spirit, struggle and not easily give up. "After watching Pinky Promise, we get more information about cancer that can affect anyone, from the poor to the rich. The key is our passion to keep on fighting. Some people give up easily while others do something meaningful for society. It's the spirit that I want to pass on to the ladies. We, as healthy women, should not give up easily while people who have more serious problems still keep fighting," said Neno. Neno hopes that the women who attended the activity can be more concerned about their own health and the importance of routine medical examination.